Peter Collingwood’s career at the forefront of weaving technique and design has spanned 45 years. this exhibition charts the development of his work from early experimental, reversible flat-weave and pile rugs to his highly contemporary ‘macrogauzes’ and ‘shaft-switching rugs’. these later, more graphic three dimensional design have involved radical alterations to the loom itself. Some works are shown on the wall and floor of the Gallery while other three dimensional pieces hang from the ceiling demonstrating the sculptural possibilities of Collingwood’s work. 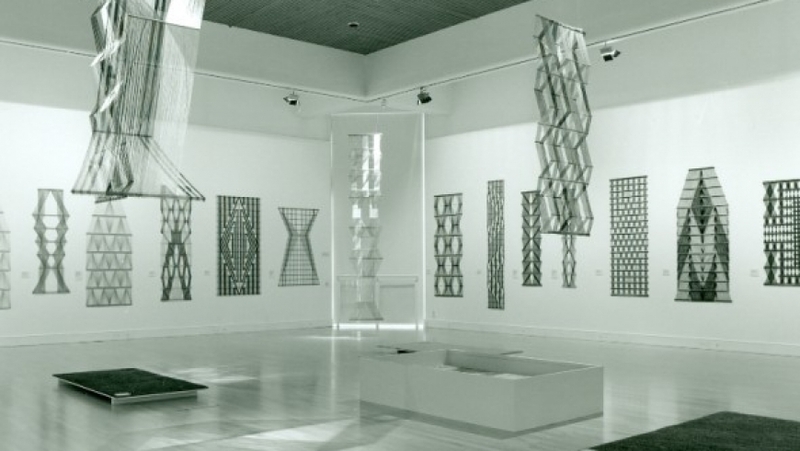 The University of Warwick Art Collection includes a macrogauze by Peter Collingwood.